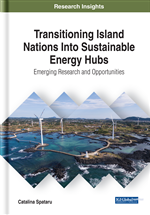 In this chapter, the author explores favorable features of the “hub” concept for islands, including the ability to exploit the meaning of “circular energy resource hubs” approach, where the term “hub” as indicated in literature means the use of multiple energy carriers as interfaces between energy producers, consumers, and transport infrastructure. The author expands the idea to “circular energy resource hubs” by integrating circular economy principles in which we keep resources in use for as long as possible, extract the maximum value from them while in use, then recover and regenerate products and materials at the end of each service life. It demonstrates some interesting advantages in terms of applicability of the concept offered by new theoretical approach. Furthermore, circular energy resource hubs could serve as interfaces between infrastructures and network participants (producers, consumers) or between different infrastructures, representing a generalization or extension of a network node. The pace of change occurring within the energy system means that efficient resource utilization is imperative. Distributed energy systems (DES) can be a key enabling factor in meeting future energy needs. However, the introduction of DES also results in more complex requirements for design and operation. Integration of DES in existing electrical grids is not straightforward; a key challenge is how to integrate a large share of renewables, which are inherently intermittent at distribution level. Moving towards a low carbon economy, increase use of renewables, and increase use of smart information communication technologies (ICT), energy hubs could play a key role in delivering real-time reaction. An energy hub is considered a unit where multiple energy carriers play the interface role between different energy infrastructures and loads (Geild & Andersson, 2007). Renewable energy may be generated locally (e.g. from PV) or by centralized means (a geothermal plant or a combined heat and power (CHP) plant located within the island that may be fuelled by biofuel or hydrogen). The size hub can vary, from a building, to local community, an island, a city, a country, a region. The concept is applicable to all types of energy flow, from heating and cooling to electricity, biogas and hydrogen, and may connect not only households but also (electrical) cars, commercial buildings or industry.